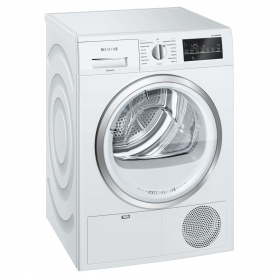 Exclusive to Euronics and Agent stores, this Siemens extraKlasse dryer boasts a 9 kg capacity and a choice of 15 programmes. Its large capacity makes the WT46G491GB ideal for families and busy households. 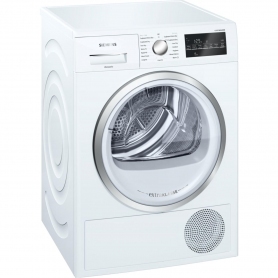 This freestanding tumble dryer in white uses condenser technology to give you perfectly dry clothes. A vented tumble dryer would need to be placed near a window or have a vent built into the wall – but not the WT46G491GB. Instead, water vapour is condensed and stored in the machine’s high-level container. This means the dryer can be put anywhere in the house – all it needs is a plug socket nearby. 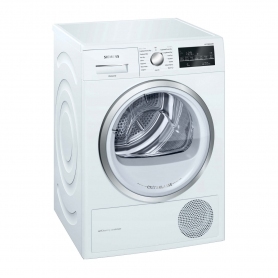 Using AutoDry sensors, the WT46G491GB can detect your clothes’ dryness, and stop the cycle at just the right moment. 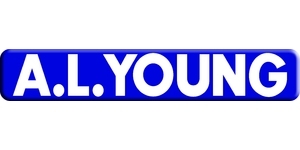 This saves energy, water, and money off of your bills. The unit also comes with a drying programme for functional textiles, such as sportswear or outdoor clothing. Siemens’ WT46G491GB has a range of great features for ease of use. The ReLoad function means that you can go back and add more items of clothing, even after the cycle has started. A large LED display can be found on the front of the machine, showing how much longer your laundry will take to dry. Choose from any of the WT46G491GB’s fantastic programmes and the display will keep track of its progress. And, using the handy 24-hour delay feature, you can even set a time for your drying cycle to begin. A built-in drum light also gives you a better look at what’s inside the dryer. There’s even a child lock to stop little wandering hands, and an easyClean filter system. Bringing together large capacity, a wide range of programmes and smart drying technology, the Siemens extraKlasse WT46G491GB covers all your drying needs. Order today.